February … the second month of the year, Brian Littrell’s birthday month and most importantly, the month of love. For boy bands, a love song is important. How else, besides your smooth vocal skills and dance moves, will win over the attention of a fangirl? Besides, the Backstreet Boys are the masters of love songs and fans know that all too well. “How Did I Fall In Love With You” also gives Jennifer a case of the feels whenever she hears it. According to Jennifer, her teenage dream was to have Nick Carter sing “I Need You Tonight” to her. “Preferably while I’m sitting on stage with him, holding my hand and staring into my eyes, while I dissolve into a puddle of nothing,” she said. In fact, if she had to pick the most romantic song by the Backstreet Boys out of the original five that she chose, it would be the popular song that Nick did solos to in Backstreet’s early days. Where are you from? Born in Los Angeles, California, raised in the San Fernando Valley, currently living in San Diego. What do you do for a living? (job, etc.) I’m a registered nurse. It’s an extremely fulfilling profession, but also a stressful and taxing one, both physically and emotionally. I’m not ashamed to say I’ve been taking some time off to do a little soul searching and see what God's plan for my life is, whether that means nursing or something else entirely. Needless to say, I love my fellow nurses; they’re angels that have traded their robes in for scrubs. Tell us a little bit about yourself: My name is Jennifer Samuel, I've been married to my dear husband for seven years. We have a little chihuahua mix named Bitsy and she is love of our lives! She's got so much personality packed into all 8 pounds of her! We like taking road trips and sightseeing and hope to get out and drive through a few more states this year. The bucket list is to visit all 50 states. We still have a long way to go! I'm a big fan of Jane Austen EVERYTHING. Books, memorabilia, movies. “Pride and Prejudice” is my favorite book. In 2016, I was blessed enough to visit one of places she lived in while she was living in Bath, England. Definitely the trip of a lifetime! How long have you been a BSB fan? Since 1997-1998. But it really hit hard in 1999. Reeeeally hard. How did you become a fan? I have a cousin that lived abroad back then, when the Boys were big in Europe and Asia before finding success in the States. We were pen pals and she’d write me pages and pages of letters, gushing about BSB, especially the blond one! Needless to say, the fangirl in her rubbed off on me and I’ve never been the same since! What is your favorite BSB memory? 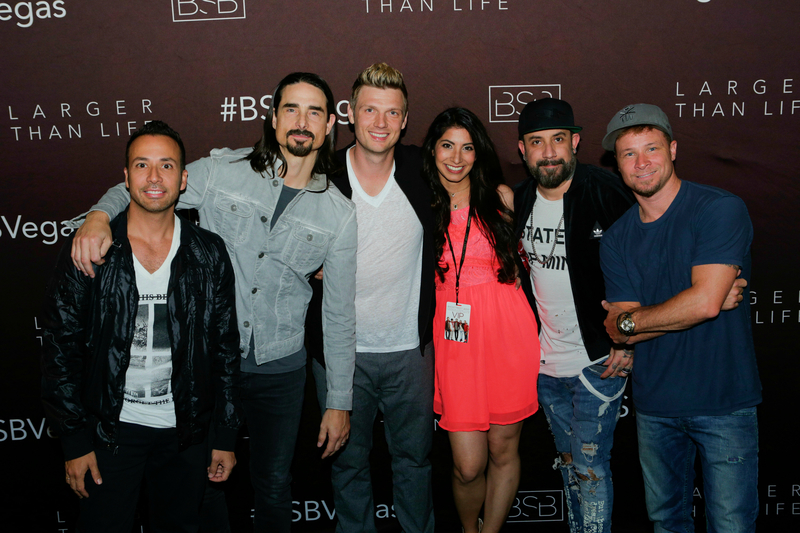 My favorite memory has to be going to my first BSB concert. I was 15. And I went alone. We had a Ticketmaster phone mishap and our order for 2 tickets never went through. When we tried to purchase them over the phone again, they had sold out. After a frenzy of tears (mine, not my mom's, just to clarify), my mom had to buy a single, *very* expensive ticket through a ticket broker. The night of the show, my folks dropped me off at the venue (after settling on a meet-up spot for afterward; remember this is waaay before cell phones). So picture 15 year old me, standing alone in the massive Great Western Forum in Inglewood, California, at a sold out show during the Into the Millennium Tour, having the absolute TIME. OF. HER. LIFE. I honestly didn't care that I was alone because no one else even mattered. I only had eyes for the five Boys, clad in futuristic outfits on that stage in the middle of the venue. I couldn't believe I was in the SAME ROOM as the BACKSTREET BOYS. My heart still pitter-patters thinking about it. What is your favorite BSB song and why? “More Than That.” The sound of it....I don't even know how to describe it. It's echo-y, celestial almost. It was so different from anything I'd heard on BSB's first two albums. Oh and can we talk about AJ's voice in it----? Still leaves me with goosebumps even today. What is your favorite BSB video and why? “As Long as You Love Me.” A good showcase of the Boys personalities and (chair) dancing moves all in one video. Plus Kevin and Howie with unbuttoned shirts. Just sayin’. Who is your favorite Backstreet Boy and why? I have a special place in my heart for each of the guys but Mr. Nickolas Carter....the boy is just something else altogether. The face, the hair, the voice, the moves, his work ethic, his daddy status (as in, FATHER, ladies...), THAT HALF SMILE... I would go into more detail but then I wouldn’t have time answer the rest of the questions. How has BSB impacted your life? Twenty something years is a lot of time to feel passionate about something. I was a child when I became a fan and the feeling hasn't lessened a bit; I'd say it has intensified. Their music has been the soundtrack of my life. So many pivotal moments are entwined with their songs. What is your favorite thing about being a BSB fan? I love the way their music brings people together. I've made so many new friends on social media and in person because of BSB and have heard similar stories from all over the world. Being a BSB fan helped me find my BSB bestie, Adrianna! We met in 2005 and have gone to pretty much every tour they've done since. I love her to itty bitty pieces! Also, I’m sure everyone has noticed, BSB have some of the most fiercely loyal fan base I've ever seen. I'm one of them, and the reason for that is simple. It's first, the dedication they have to their fans. Second, the determination and drive they have for their art form. Third, their cohesiveness as a group. All of these things have allowed them to retain that longevity. As long as they'll be singing (and even when they're not), they'll always have a fan in me. Have you been to Vegas? If so, how many times and if not, are you planning on seeing a show? YES!! Fitting question since I’m actually IN Vegas as I type this! This is my second go-round. My first trip was last April 2017, which was also my first time meeting all the guys. And now with the new dates, I’m itching to get back already and we haven’t even left yet! For anyone on the fence about seeing the Vegas Residency show, DO IT. You will not regret it. It's worth every single penny.